Home » Collection » "Titian's Schoolmaster"
Few artists could match Moroni's skill in depicting the appearance of his sitters, far less his ability to conjure the inner workings of their minds. The identity of the gentleman in this penetrating portrait is a mystery. For a long time the painting was thought to be by Titian and to represent that artist's ideal of a schoolmaster. But according to another tradition, the picture got its name because Titian admired it and learned so much from it. Whether or not the older master ever saw this painting, Moroni's strong, simple composition and trenchant characterization did impress two later specialists in portraiture: Anthony van Dyck and Joshua Reynolds both made copies of it. The subject, dressed all in black, sits in a Savanarola chair that is seen -- unexpectedly -- in profile. He rests one beautifully drawn hand on the arm of the chair and turns as if to regard the spectator. With his other hand he holds his place in a book, thoughts of which, judging from his absorbed gaze, still occupy his mind. The white, embroidered collar sets off the face, and the asymmetrical points echo the man's uneven features. Even the bristly textures of the trimmed whiskers and clipped, grizzled hair command attention. Borghese collection, Rome by c. 1622 until after 1793; purchased 1800 by Robert Fagan [c. 1761-1816], Rome, who sent it to England; sold to William Buchanan [1777-1846], London; Walsh Porter [d. 1809], London; purchased before Porter's death by George Granville Leveson-Gower, 2nd marquess of Stafford and 1st duke of Sutherland [1758-1833], Cleveland House, then Stafford House, London; by inheritance to his son, George Granville Sutherland-Leveson-Gower, 2nd duke of Sutherland [1786-1861], Stafford House; by inheritance to his son, George Granville William Sutherland-Leveson-Gower, 3rd duke of Sutherland [1828-1892], Stafford House; by inheritance to his son, Cromartie Sutherland-Leveson-Gower, 4th duke of Sutherland [1851-1913], StaffordHouse; (Duveen Brothers, Inc., London, New York, and Paris); sold February 1909 to Peter A.B. Widener, Lynnewood Hall, Elkins Park, Pennsylvania; inheritance from Estate of Peter A.B. Widener by gift through power of appointment of Joseph E. Widener, Elkins Park; gift 1942 to NGA. William T. Whitley, Art in England, 1800-1820, New York and Cambridge, England, 1928: 11-12. The 1809 "Catalogue and Description of the Pictures belonging to the Marquis of Stafford at Cleveland House" (Staffordshire County Record Office, D593/R/7/5) records the acquisition of the painting by Stafford from Porter, who died in May 1809. See: Peter Humfrey, "The Stafford Gallery at Cleveland House and the 2nd Marquess of Stafford as a Collector," Journal of the History of Collections 28, no. 1 (March 2016): 49, 51 fig. 7, 54 n. 40. In a Duveen Brothers ledger recording sales from 1901 to 1910, under Peter A.B. Widener's name for 12 February 1909, is this entry: "1 painting of a man by Moroni 'Titian's Schoolmaster' ex Sutherland Colection" (Duveen Brothers Records, accession number 960015, Research Library, Getty Research Institute, Los Angeles: Series I.A. New York House, 1886-1960, reel 4, box 5, New York Sales 1901-1910, page 182, copy in NGA curatorial files). Loan Exhibition of Important Early Italian Paintings in the Possession of Notable American Collectors, Duveen Brothers, New York, 1924, no. 28 (no. 48 in illustrated 1926 version of catalogue). The Genius of Venice 1500-1600, Royal Academy of Arts, London, 1983-1984, no. 64. Giovanni Battista Moroni: Renaissance Portraitist, Kimbell Art Museum, Fort Worth, 2000, no. 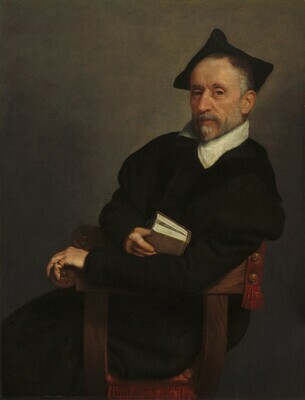 9, repro., as Portrait of a Cleric ("Titian's Schoolmaster"). Berenson, Bernard, and William Roberts. Pictures in the Collection of P.A.B. Widener at Lynnewood Hall, Elkins Park, Pennsylvania: Early Italian and Spanish Schools. Philadelphia, 1916: unpaginated, repro. Paintings in the Collection of Joseph Widener at Lynnewood Hall. Intro. by Wilhelm R. Valentiner. Elkins Park, Pennsylvania, 1931: 156, repro. Tietze, Hans. Meisterwerke europäischer Malerei in Amerika. Vienna, 1935: 91, repro. (English ed., Masterpieces of European Painting in America. New York, 1939: 92, repro.). Duveen Brothers. Duveen Pictures in Public Collections of America. New York, 1941: no. 167, repro. Works of Art from the Widener Collection. Foreword by David Finley and John Walker. National Gallery of Art, Washington, 1942: 6. Paintings and Sculpture from the Widener Collection. National Gallery of Art, Washington, 1948 (reprinted 1959): 21, repro. Einstein, Lewis. Looking at Italian Pictures in the National Gallery of Art. Washington, 1951: 90-93, repro. Cairns, Huntington, and John Walker, eds., Great Paintings from the National Gallery of Art. New York, 1952: 66, color repro. Cairns, Huntington, and John Walker, eds. A Pageant of Painting from the National Gallery of Art. 2 vols. New York, 1966: 1:190, color repro. Shapley, Fern Rusk. Catalogue of the Italian Paintings. 2 vols. National Gallery of Art, Washington, 1979: I:339-340, II:pl. 247. Walker, John. National Gallery of Art, Washington. Rev. ed. New York, 1984: 223, no. 277, color repro. European Paintings: An Illustrated Catalogue. National Gallery of Art, Washington, 1985: 288, repro. Campbell, Lorne. Renaissance Portraits: European Portrait-Painting in the 14th, 15th, and 16th Centuries. New Haven, 1990: 79-80, color fig. 89. National Gallery of Art, Washington. National Gallery of Art, Washington, 1992: 103, repro. Humfrey, Peter. "The Stafford Gallery at Cleveland House and the 2nd Marquess of Stafford as a Collector." Journal of the History of Collections 28, no. 1 (March 2016): 49, 51 fig. 7, 54 n. 40.